Our new perfume lines are inspired by the fragrance bar at our store, Melange Apothecary. Each perfume features our most popular notes & blends, beautifully packaged and priced within reach. 16 separate & distinct blends. No. 1 - No. 7 (Blue Box) are lighter & cooler fragrance blends; No. 8 - No. 14 are warmer & heavier fragrance blends. Alcohol free, we use a base of natural Coconut Oil Fractions and Hawaiian Kukui Nut Oil. Visit our website for detailed descriptions of each blend. 27 select fragrance notes formed in a base of natural Beeswax & Jojoba Oil. This painstaking process produces a beautiful solid perfume that glides onto the skin. Each perfume is designed to be worn alone or blended with one another to create a custom fragrance. Visit our Blending Guide to help you select notes for blending -- or you can release your inner-perfumer and create your own... the possibilities are endless. Green Box/ Green & Citrus - Pink Grapefruit & Jasmine; White Tea & Ginger; Mandarin & Green Tea; Mimosa Blossom & Citron; Green Tea; Paperwhite. Orange Box/Warm & Woody - Amber & Santal; Tobacco Leaf; Santal & Lily; Vanilla Orchid; Cedar, Musk & Patchouli; Amber Noir. 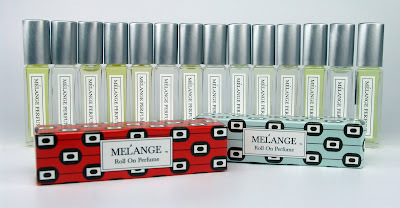 Our Melange Perfumes are also available at our retail store, Melange Apothecary.